Golden was originally known as "Goldville" and was established in 1890 by a man named William Ruble. The first post office was established on January 10, 1896; Schuyler Ruble was the first postmaster. As its name implies, Golden was established due to the placer gold mining. William and Schuyler Ruble invented the Ruble elevator and patented it in 1890, increasing gold recovery. Gold was first discovered in the mid 1850's and was sluice box mined until the late 1870's when the first hydraulic giant was introduced. By the mid 1880's William Ruble had purchased nearly all mining claims east and west of Golden. William's sons, Schuyler and William, mined the shallow ground and leased the deeper ground to other miners. Coyote Creek was continuously mined will into the mid 20th Century. The activity was so great in the late 1870's the Oregon-California Stage Company detoured to what is now Golden to deliver mail, passengers and goods--a fact established by William Ruble's deed records. 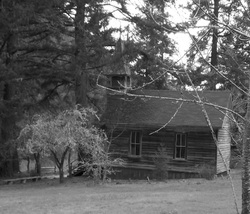 Golden is one of the few mining camps in Josephine County at which original buildings are still standing: the Golden Church built in 1892, a general store built in 1904 and part of the William Ruble residence built in 1892. We started the investigation around 1:30 pm in the afternoon. Then we split into smaller groups and started taking pictures around town with the digital and the IR cameras. During the camera sweep of the church we encountered several coldspots in the right corner of the church. Around 8:30 pm we head inside the church and started our EVP session and we placed the EMF meters around the front of the church. I had the Mel EMF meter in my hand and while we where doing the EVP session the temperature dropped from 55 degress fahrenheit to 46 degrees fahrenheit and I felt a cold breeze passing by me. After awhile we stopped the EVP session and decided to go outside to the Ruble's house and the cemetery but we left the digital recorders still recording inside the church while we are outside. Around 9:30 pm we went back inside the church and started another EVP session but this time we brought the parabolic dish with us. 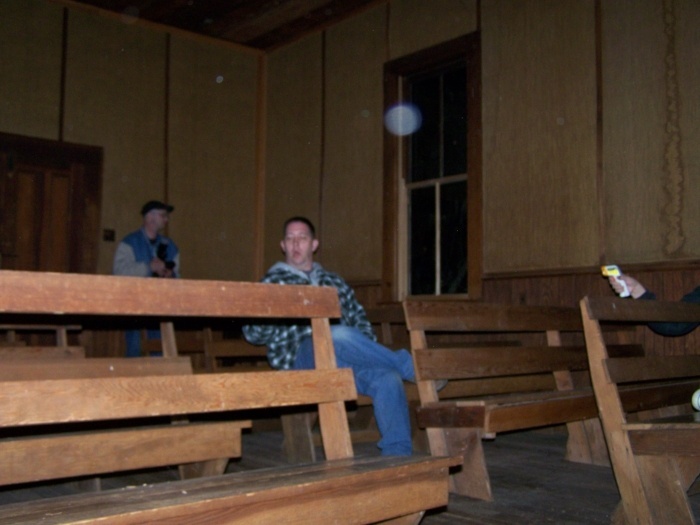 During the EVP session, I heard several tapping noises and several voices with the parabolic dish. We ended the investigation around 11:30 pm. It is wonderful town and we had a great time investigating it. Children Laughing & "Someone is coming"